Campus Martius (Latin for the "Field of Mars", Italian Campo Marzio), was a publicly owned area of ancient Rome about in extent. In the Middle Ages it was the most populous area of Rome. The IV rione of Rome, Campo Marzio , which covers a smaller section of the original area, bears the same name. Before the founding of Rome, The Campus Martius was a low-lying plain enclosed on the west by a bend of the Tiber River near Tiber Island , on the east by the Quirinal Hill , and on the southeast by the Capitoline Hill . According to one legend, the Campus Martius was once a field of wheat owned by Tarquinius Superbus, last King of Rome, but was burnt during the revolution which established the Roman Republic. In the first centuries after the city's founding, the area was still outside the Servian Wall. The Campus was used for pasturing horses and sheep, and for military training activity of both the army and of private people who could use the training equipment the army had left. As such, it was dedicated to Mars, the Roman god of war, with an ancient altar and became closely linked to soldiers and the army. Initially, the field was often used by soldiers for purposes of training. Later, it was frequently the focus of Triumphs, the celebrations of successful military campaigns. Because at the time it was outside the city walls, the Campus Martius was a natural place for audience given to foreign ambassadors who could not enter the city, and foreign cults were housed in temples erected there. In 221 BC, the Circus Flaminius was built on the southern side of the Campus Martius, near the Tiber. This large track for chariot racing was named after Gaius Flaminius Nepos, who also constructed the Via Flaminia. Starting in the time of Sulla, building lots were sold or granted to influential Romans, and insulae (apartment blocks) and villas encroached on the common land. It later became the place for comitia centuriata, civic meetings with weapons, and for the city's militia. Pompey built the first stone theater in Rome in the Campus Martius in 55 BC: this was the first real monument in the area. When the Curia Hostilia burnt down in 52 BC the theater was sometimes used as meeting place for the Senate. It was here that Julius Caesar was murdered in 44 BC. The area was also used as the meeting ground for elections. Julius Caesar planned for the Saepta (enclosures used for elections) to be placed there; they were later completed by his heir Augustus. In 33 BC Octavian dedicated the Porticus Octaviae, built from spoils of the Dalmatian War. 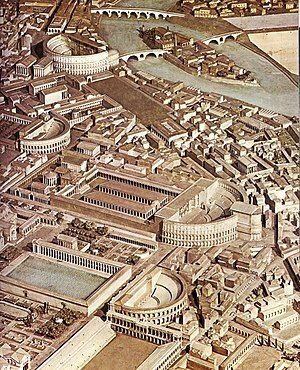 During the Augustan period of the early Roman Empire, the area became officially part of the city: Rome was split up into 14 regions, and Campus Martius was divided into the VII Via Lata on the east and the IX Circus Flaminius nearer to the river. The Campus Martius also held the Ara Pacis (Altar of Peace), built by the Senate to mark the establishment of peace by Augustus. It was intended to symbolize the successful completion of Augustus's efforts to stabilize the Empire. Marcus Vipsanius Agrippa had the original swampy ground made into a pool and baths in a setting of parkland and temples, the Laconicum Sudatorium or Baths of Agrippa , and he built the Porticus Argonautarum and, most notably, the Pantheon , which was later rebuilt by Hadrian as it still stands today. In 19 BC he additionally completed the Aqua Virgo to supply water to these new baths and fountains. In the non-populated northern area there was the huge Mausoleum of Augustus . Other buildings were made: the Theater of Marcellus, the temple for Isis (from around the time of Caligula), the baths and bridge by Nero. After the great fire of the 80, Domitian rebuilt the burnt monuments plus a stadium (eventually to become today's Piazza Navona ) and an Odeion (a small performance hall). Gradually, the Campus filled with temples and public buildings, circuses, theaters, porticoes, baths, monuments, columns and obelisks. Interestingly, even though the area was originally named for Mars, there was no monument dedicated solely to him in the later Roman period. Although the region had been left outside the earlier walls, it was finally protected defensively when the Aurelian Walls were built around 270. After the barbarian invasions cut the aqueducts, the rapidly dwindling population abandoned the surrounding hills and concentrated in the Campus Martius, depending on the Tiber for water, but subject to its flooding.Since it was next to the river and next to the Vatican , the area became the most populous part of Rome in the Middle Ages. The river supported a thriving economy and a supply of water, and the continuous stream of pilgrims to the city brought wealth to the area. The main road connecting Rome to the rest of Europe was the Via Cassia, entering Rome through the Porta del Popolo ("door of the people") in the northern part of the Campus Martius. Via Cassia became the most important road in medieval times, because it connected Rome with Viterbo , Sienna and Florence . The other main road to Rome, the Via Aurelia, became unsafe in medieval times with the spread of malaria, because it passed through the unhealthy marshes near several coastal lakes in the Maremma lowlands (as Orbetello lagoon, Capalbio lake and other Tombolos), and because its route by the sea made it more susceptible to attack from raiders. The coastal towns around via Aurelia were areas subjected to women kidnapping and plunder made by Muslim saracen pirates. Because of the increasing importance of the area, several popes decided to improve its conditions. In the period 1513-1521 Pope Leo X built a route connecting Porta del Popolo to the Vatican. This road was first called the Via Leonina after the pope, later the more famous Via di Ripetta after the name of the river port. To improve the hygiene of the area, several ancient Roman aqueducts were restored to operating condition. As the population of Rome greatly increased in the Middle Ages, the Campus Martius became a crowded multi-cultural place where many foreigners settled. In 1555, Pope Paul IV designated part of the southern part of the Campus Martius as the ghetto to contain the city's Jewish population. After the Renaissance, like all the rest of Rome, Campus Martius did not change much; there were no other great building projects and the population decreased. This was reversed after Rome became capital of the new-born Kingdom of Italy in 1870. After this, the area became even more crowded, and protecting embankments were built to stop the flooding of the Tiber. This made the area much safer from threat of water, but the tall embankments effectively destroyed the traditional embarkation point called the Ripetta ("little bank"), the narrow streets leading down to the river, and the vernacular buildings along the river edge. The Champ de Mars in Paris shared the name and military orientation of Campus Martius. Detroit, Michigan 's Campus Martius Park is a downtown park inspired by Rome's Campus Martius.